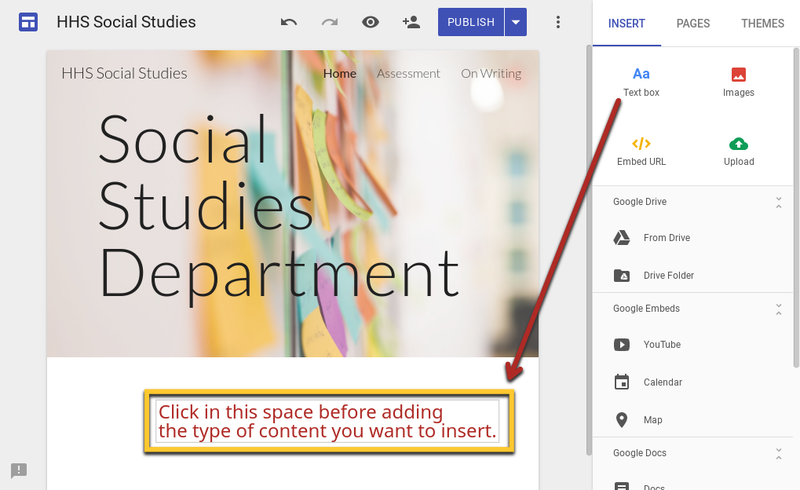 The new Google Sites is here. Well, almost. I've been previewing it through my GAFE account and it's growing on me. I'll admit that I was not too fond of it, at first – a little hesitant to invest time into something that'll likely change. But then I realized that if it's ready to go for this school year, delivering content will be slick. I think some will like it. Some will use Sites for the first time because of the new platform. And others won't care because it's easy. Here are some more reasons why I think people will like the new Google Sites. You don't need to know HTML. Everything is click and choose. There's no site manager versus edit site layout to find settings in two different places. Confusing, I know. The intuitive design is exactly what my students need, as well as my novice tech-using colleagues. 2. Layouts automatically adjust for devices. The preview button takes you to a screen in which you can choose among mobile phone view, tablet view, or monitor view. This is nice because no matter what is changed on the site editor, the content will adjust for the device being used to access it. One less thing we have to check and manually adjust (not that it was ever too difficult). The image below shows the mobile view and the options (black background). 3. Drive integration provides options. This is most important feature of the new Sites. 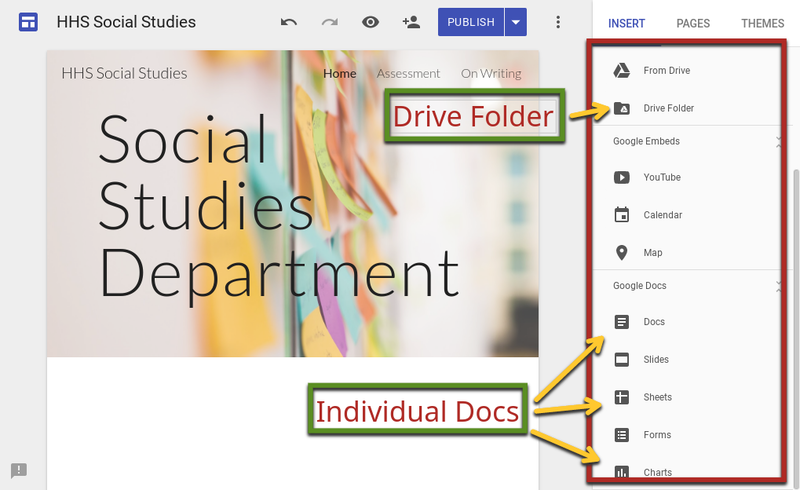 You can add the contents of a folder, like a window into your Drive, or a folder itself. The old sites could do this after jumping through a few hoops, but it never looked and worked as slick as the new Sites. 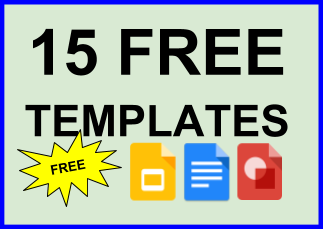 The ability to add individual drive files and embed calendars and YouTube with only a few clicks is another feature that makes this version worth your time. Although this is not totally different than the old version, it's a lot easier. Adding a video without calculating aspect ratios is enough to make me happy. 4. The flat design looks professional. Websites are about ease of use. The ornate style of some of the old Sites templates can be a bit much. Maybe once upon a time those notebook back drops or full red brick walls were the way to go. Not anymore. We want it simple and clean. That's why the content needs to be good. That's what it's all about, once the look is easy enough to draw in the user. 5. More is still to come. 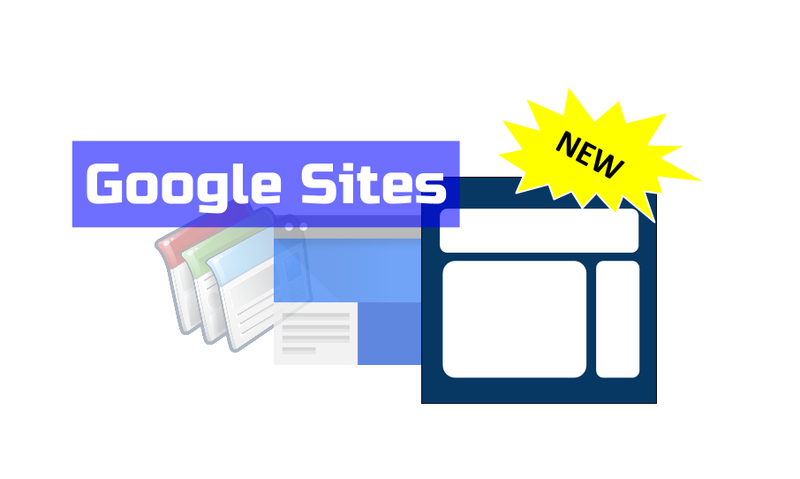 In typical Google fashion, the new Sites app will have more updates. New features will probably come by way of feedback submitted by users and will require all of us to be patient. Think about how far Docs has come in the last two years. Give Sites some time, and it will be your go-to for fronting your content. I promise. Here's a video of me messing around, making an intranet site for a social studies department. I had a great time learning from other educators yesterday at #edcampldrma. Among the breakouts was a well-attended session on going gradeless. Most of the conversation was about implementation of innovative grading practices and standards-based grading, but it got me thinking about where my former district started when it went through the tough process of culture change – because that's essentially what has to happen. We read books about grading, books about change, and, of course, Mindset. We started with what we believed about learning and grading to establish a foundation that we could all build upon. That's where the messy part started. Making district policy that threw out practices as American as baseball and jazz got a lot of push back, which is why we had to unpack the arguments of our adversaries while presenting our own. Grades are a powerful way to motivate your students, right? Perhaps it can promote compliance, but we have to question what we want kids to be motivated to do. Motivation to learn is not the same as the will to stay out of trouble. There is a missing piece that reminds me of the five monkeys experiment. Here's a minute and a half explanation (please reflect on it, take it in). Are you a monkey about grades? 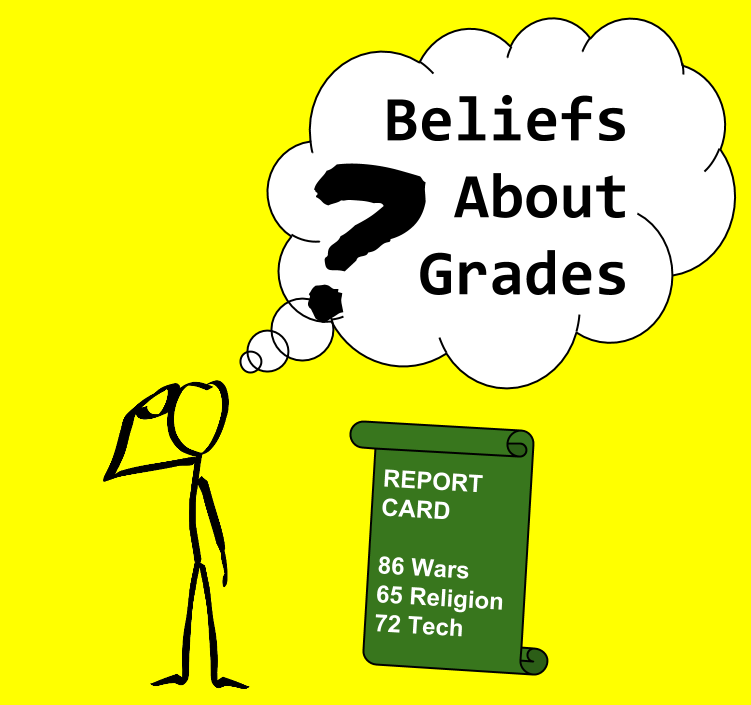 If you think it's time to rethink grading, understanding your specific beliefs about grading is a great place to start. "It worked for those kids. It's not my problem if these others can't get it the way we do it." Fixed Mindset: We are born with a certain level of intelligence. Growth Mindset: We are born with many intelligences to be discovered and developed over a lifetime. Building relationships with students is a non-negotiable when it comes to successful learning. Teachers who know their students not only believe that they can learn, they can speak to the kinds of conditions under which their students thrive. A fixed mindset may confuse a slower learner for one that can't learn, while a growth mindset does not believe in the latter and makes time for whatever pace the learner needs. 2. People learn at different rates and at different times. "It's unfair to the students who get it right the first time." Who said? Fixed Mindset: The curriculum dictates a schedule that will be followed whether you learn it or not. Growth Mindset: Mastery can be demonstrated at anytime within a reasonable timeframe or to accommodate learners with extenuating circumstances. This is not a rule I've ever read. It may exist in a reassessment policy somewhere, but I guarantee you that such a place is not making much progress or working with a diverse population, one that reflects the challenges we're preparing our youth to overcome. Reassessment can be hard on teachers if they believe that their reporting deadlines are a higher priority than facilitating learning. I've let kids reassess on something several weeks after report cards were issued. A change of grade form only takes 30 seconds. "They'll want to reassess everything. They won't study because why should they?" I can say with confidence that a teacher with a wide open reassessment policy has never said this. Like any policy, fine tuning is required, especially to make it work for individual professionals. Growth mindset teachers say things like, "Sure, you can reassess once we've reviewed your results and you complete an action plan that details which standards you'll complete that require more practice." In other words, just because the grading cycle is over, doesn't mean the development of the knowledge skills should be, too. 3. 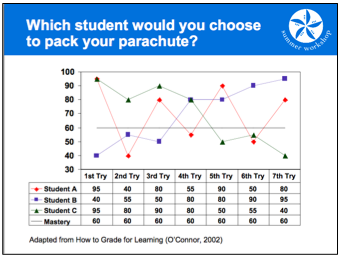 Grades communicate student achievement. Fixed Mindset: The kids get zeroes – again and again – but I keep giving zeroes because it's what we've always done and it works. Growth Mindset: Grades summarize student achievement relative to the coursework, which is based on a common curriculum. It's hard (sometimes impossible) to report achievement without evidence. Grades don't manage behavior. You may think so, but consider the amount of repeat offenders you encounter under that assumption. 4. Accuracy is vital to reporting grades. Fixed Mindset: If you want to boost your grade, do some extra credit. Growth Mindset: Taking points off for late work or adding points for extra credit takes away from the grade assigned for achievement on an assessment. To give an achievement score at the end, the criteria must be clear from the beginning. Both standards-based grading has helped me report more accurate grades. 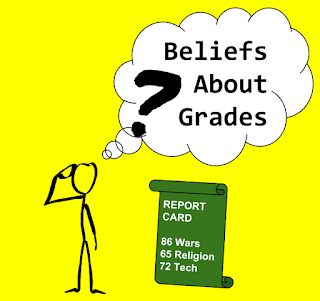 The two implications to standards-based grading are (1) Using most recent evidence and (2) Grades must be relative to standards. Using the most recent evidence to report achievement relative to standards tells the stakeholders the story of achievement that averaging a bunch of (sometimes unrelated) scores to slap a letter on a kid's academic record. "You don't have to be mean." Inflating and deflating grades are out, too. This ties to the second implication listed above. That means, no more extra credit points or taking points off for late work. If we want our students to develop a growth mindset, we need to give them a chance and let go of using fixed measures to coerce compliance. 5. Feedback – not arbitrary grades – is an inroad to achievement. Fixed Mindset: Making comments on all of those essays will take forever. And they don't read them. Growth Mindset: Actionable feedback, not scores, shows learners where and how they need to improve. This one is simple. When students see a number, it consumes their attention. When they see only comments, the focus on what they need to do to improve. When they see both, the number takes all. Ken O'Connor talks about this in his workshops and presentations, and I've lived it as a classroom teacher. 6. Zeros do not work. Fixed Mindset: It's what we've always done. Growth Mindset: Work assigned is work to be completed as part of a set of evidence that informs a teacher on the achievement level to be reported on transcripts. They don't. Sure, no one wants a zero, so we do our work. But it also implies that you can still get credit without doing all of the work. Try that for college and career readiness. Don't forget the five monkeys experiment. Don't do it because it was done to you. 7. Grades, when they are accurate, promote confidence in the learning process. Fixed Mindset: Grades group and rank kids to decide who gets what. Growth Mindset: When learners know their achievement as it relates to what it needs to be, they gain confidence when the path feels plausible. We like to know if we're good at something or not. Grades tell students their strengths and weaknesses. I'm thinking we gain a lot of our confidence from receiving feedback on our progress from someone we trust and achieving a higher level than when we do well out of the gate. I believe this because it's we are emotional beings. When we struggle and succeed, it sticks. We can only know our struggles of we have something to compare. No one ever said maintaining a growth mindset was easy, but you get better at it if you try. For the first years of a child's life, it's "Say something!" and "Stand up and walk to me!" Once we get them in a classroom, it's "Sit down and shut up!" Okay – not that extreme. But it sure can feel that way. Voice is complex. It's more than being heard. It's realizing what becomes of the voice-audience relationship. There's probably a more clinical way to describe this relationship, but it won't matter much. The key ingredients for my student voice model nurture the following. Listening is key to amplifying student voice. Classrooms in which students are encouraged to provide suggestions. Opportunities to use technology to build digital citizenship and literacy. I try to create an atmosphere that promotes dialogue and student contributions. It's not always easy to see when it's successful because it can become chaotic. Sometimes, however, it's very clear, especially when it's a student suggestion that led to the lesson design. Although it's not easy to take suggestion about teaching from non-educators, when kids speak up about what they want in their education, I listen. In fact, I am most proud of the work I do when a student initiates a conversation about the work they do. This story is about my introduction to Google Docs during the 2012-2013 school year. It was another day in the computer lab. Students were working on an extended essay for their IB diplomas, and I was catching up on some lesson planning. I still remember George looking at my screen and looking back at his as if he wasn’t ready to reveal his curiosity (he was non-verbally quirky like that). I was having trouble with my thumb drive when I slowly looked over at him and stared until he broke the silence. “Ah, you could forget about using thumb drives and just store your files on Google Docs,” he said quickly before ducking his head behind his monitor. George told me the nuts and bolts during that last block on a Friday in spring 2013. I’ll always remember the day like I’m reliving it because of the closeness of the classroom we established that year. It was a place where students felt like their contributions mattered. They could see that I was listening and making changes according to their needs. This was a classroom with student voice and opportunity for ownership of the learning. 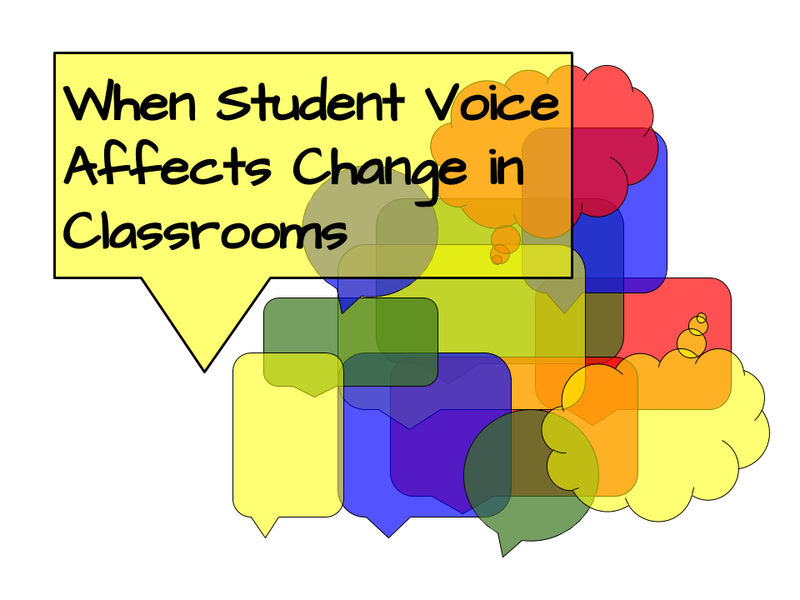 The end of my third year teaching left me with a need to take student voice to the next level. 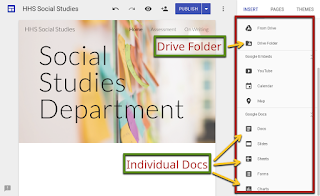 I thought back to that day in the computer lab and decided that learning more about Google Docs, which would soon become Drive, was the way for me to move forward and grow professionally. That summer, I joined several colleagues at our district-hosted technology conference, Lonestar Technology in Action 2013. I learned about the SAMR model, Google Hangouts, Moodle, and a few tricks on iPhones and iPads. Little did I know that my experience at that conference would nudge me in a different direction. 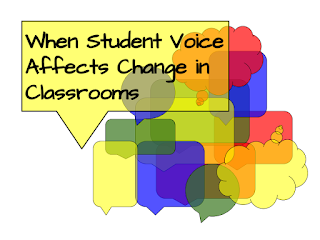 We should want our students to feel confident that their voice is heard and that it makes a difference. Here are a few stories that have been formative in my approaches to teaching and learning. George shared a tool that changed me forever. Another example of student voice that changed the way I make technology decisions came from a sophomore during the 2013-2014 school year. "Seriously, Mr. Zahner. We have too many accounts – too many passwords to remember," Sophia said walking into the class one morning. "We'll take a look at it and talk it over with the whole class," I replied. This is a much shorter story with just as much impact. It was as simple as a student feeling confident enough to speak up about the things I was asking them to do. For many of the students, the accounts for multiple edtech tools was no big deal. But no one argued, especially not me, that fewer accounts would be easier. It was long before many tools allowed users to log in with a Google account. I think Quizlet was the first that I noticed with this feature. The problems we struggled with were not special to our classroom. Learners all over the world were struggling to integrate technology in ways that promote more learning and new opportunities. When I could finally see the forest for the trees, I was focused on the effects of a tool. What did it have to offer for all of my students? The same year a student told me that we used too many apps, a girl let me have it on using Twitter for learning. She said that she would not use Twitter for class and that there was nothing I could do about it. There wasn't a thing I would do about it. Forcing someone to use Twitter, or any social media, is a violation of basic freedoms -- another lesson from a student who spoke up. The refusal to use Twitter for classwork only forced me to dig deeper. I wasn't brought down by the failing notion of a connected classroom. It just meant that I had to make it happen by different means. I replaced Twitter with Today's Meet and Poll Everywhere. Kids have never complained about these, which is no surprise because I found them on a wave of motivation spurred by the voices of my students. Their concerns and criticism will forever play a key role in my evaluation of digital tools. Something else happened during the 2013-2014 school year – I was introduced to Verso App. It's great that the students in the stories above had the confidence to speak up about their concerns and suggestions. Verso App showed me that there are voices hiding in quiet places where they are more comfortable than in the open where people might respond, throwing off they way they prefer to process information. I've written other posts about how Verso App supports the learning process, so I won't go into detail. But I will urge educators to use it for the benefit of facilitating critical discussion in a space that's safe for every student. I am most proud of stories like these because it was students who spoke up and changed the way our classroom activities were designed. The first time I heard the name PowerPoint was during my sophomore-level archaeology class in 2000. Fast forward to 2009, when I did my student teaching, and you would see the beginnings of my slide presentation chops being worked on a daily basis. At the time, I was making them for survival. I had no idea that one day we would be able to make slide presentations with an app on our phones while someone across the room, or across the world, worked on the same document. Although I don't make slide presentations for survival anymore, I continue to work on the craft of making slides that make a difference. With my tool of choice at the students fingertips, the limits of the classroom walls and the slideshow concept are flattened in today's connected world. Here are some of things I've learned over the years. It's important to give your viewers a visual experience that outlines the main ideas and sections of your presentation. I think of the different slides in the layouts palette as a background for headings and subheadings. If you want the viewer to focus on a question or theme throughout a section, dedicate a whole slide to the text instead of burying it in a slide with too many ideas happening at once. 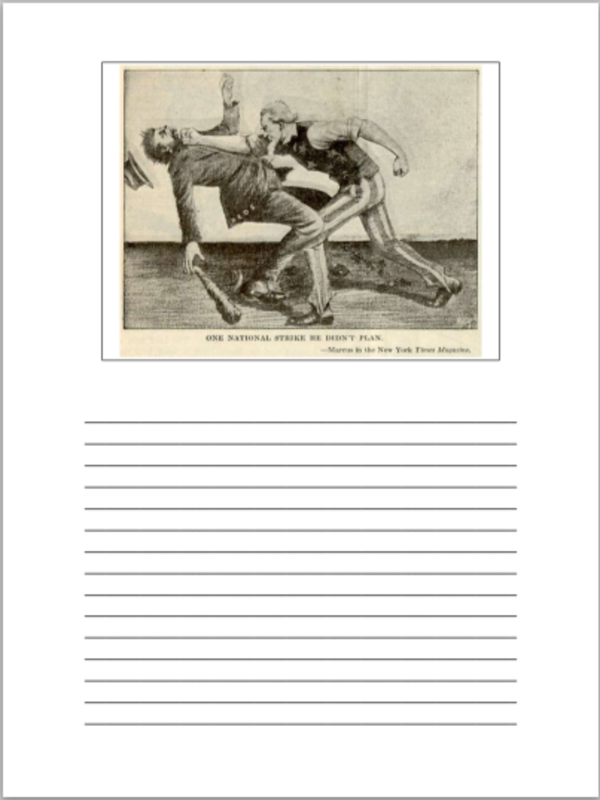 Slides is great for making books because of the blank slate that it provides. It conveniently downloads to PDF, like Docs or Drawing. It also allows you to insert links to other slides, which makes it easy to add an interactive table of contents. I love the new Q&A tool. It's not particularly hard to use, so definitely take advantage of it. If you want to work beyond the explicit intended use of Q&A, check out this post about different activities you can do with Q&A. If you have slide presentations – Google or Microsoft – and they have a lot of text, move the text to the speaker notes. The fact of the matter is that slide presentations are better when they have images or designs that elicit thought or express ideas. Lots of bullet points, not that they are always bad, can distract the audience and perhaps bring out an impulse to make note of everything as to not forget the information. This situation is especially true for students taking notes. Many people have a hard time not writing down the bullets, even when the file is accessible during and long after a presentation. To share an activity from Alan November, research PowerPoints (PPTs) on a lesson topic. Let's say the topic is social Darwinism. Have students search the Internet for PPTs to find five of the best that the world has to offer. Then, organize the students into groups in which the goal is to combine the best slides into one great presentation. They can present what they learned by discussing why they chose certain slides. Collaboration doesn't have to be among people in the same room. You could make review slides with an advanced placement classroom across the country, for example. The nice thing about using Slides is that the teaching and practice materials are one in the same, so it's more versatile. This past year, for example, I focused on visual analysis and finding author intent. 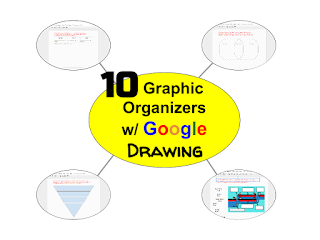 I would introduce content or concepts by displaying a series of images or a cartoon, and the students responded using a visual analysis thinking routine. The worksheets can be made by printing the slides three to a page, which automatically provides lines next to each slide. For more in depth analysis on a single image, such as cartoon, I made lines in the speaker notes and printed one slide per page and included speakers notes (shown below). This was enough for my students because our cartoon analysis routine is posted in the classroom. One of the things that I love about Chrome and Google apps is the ability to add extensions. These tools come in many forms, including scripts that bridge Slides with outside Web applications like Poll Everywhere. For me, Poll Everywhere isn't replaced by Q&A because it allows better data presentation and a wider variety of question formats. I think of Q&A like a feature on my toolbox and Poll Everywhere as a tool in the box. Check out this app smash in more depth. I made a Jeopardy template by linking the question board choices to specific slides. The only thing that I do not like about the links is how the they don't change color after being clicked. If they did, it would be easier to see which ones are left to choose. Vocabulary games are also a must if you want to be a Slides pro. It can be as simple as a few words for cherrades or more complex, like an image that one student sees and describes while the other looks away and draws. Make it more creative by assigning a choose-your-own adventure activity. 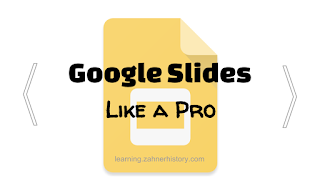 Students can make one by embedding links to other slides. This project could also work for an interactive debate. "Agree?" – click here. 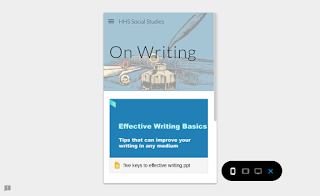 Slides is a great way to add rich content to your blog or website. 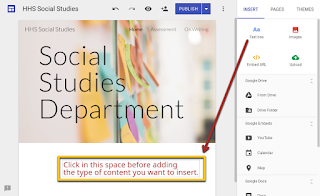 Simply publish the Slides document, and copy the iframe or embed link to paste into the html view of your page editor. Help: If you are unsure where to paste the iframe, write a cluster of "p" in the html editor so you can locate the spot in the html view. This is one of my favorite tricks. It's borderline wizardry for some people. The idea is to project a smartphone or tablet to the computer via AirPlay (or miracast) and the Air Server application, which is installed on the computer. Once the software is installed and the devices are synced, Slides can be controlled without being tethered to the computer. What's more, the display on the smart device being mirrored shows a timer, notes, next slide, and the slide you're on. As a classroom teacher, it's the only way to be anywhere in the room with so many tools at my disposal. For example, kids often ask questions that are hard for me to answer off the top of my head with the kind of substance I expect from them, so I simply transition to Google search and model how I would search for answers. 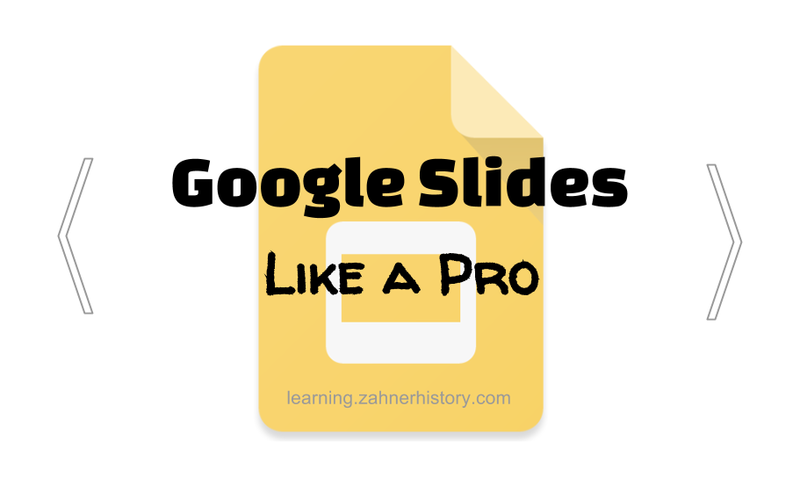 Thanks for reading, and please share how you're a Google Slides pro!